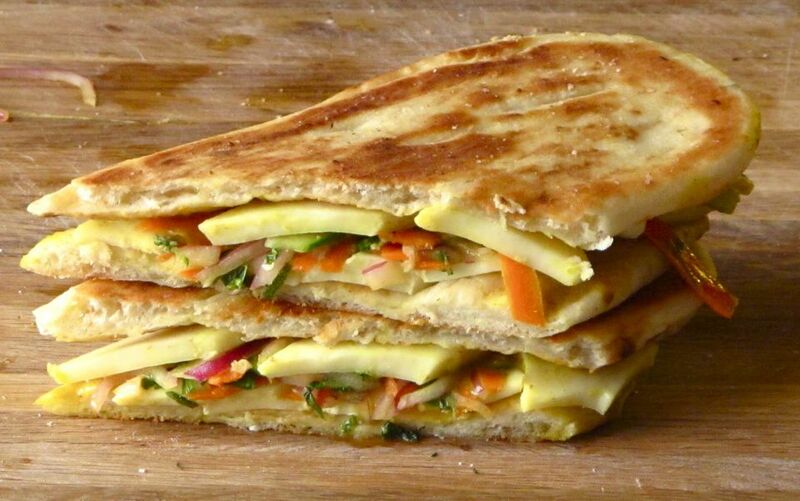 Quick pickled slaw, made with carrots, cucumber, onion, mint and cilantro, paneer cheese, and yellow curry sauce get grilled between ​two crispy pieces of naan bread to make one Indian style grilled cheese that is crisp and fresh. Begin by adding the chopped carrots, the cucumber, red onion, mint, cilantro, cumin, salt, and sugar to a bowl. Toss the vegetables around and add the rice wine vinegar. Let sit for about 30 minutes. After the vegetables are done pickling, add the paneer to one slice of naan and smear it with a yellow curry sauce. Add the pickled vegetable slaw and top with the remaining paneer. Finish building the sandwich by adding the other piece of naan on top and smearing the entire sandwich with butter. Let the sandwich cook for a few minutes on one side until the crust has become a golden brown color. Since paneer doesn't melt like normal cheeses, don't worry about it melting. As long as it's heated through, it will still taste awesome and semi-elastic-y. Once one side is ready, gently flip the sandwich and repeat until all the cheese has heated through and the other side is as toasted and crisped up as side 1. When the sandwich is ready, remove it from the heat and let it sit for a few minutes before serving.